Mumbai: Megastar Amitabh Bachchan has been honoured by the US Embassy to acknowledge his immense contribution to the India-US ties on tuberculosis. The award was presented on January 8 by US Ambassador to India Richard R Verma to the 74-year-old actor, who himself is a TB survivor and brand ambassador for the cause. Bachchan took to his blog to share the pictures from the event. 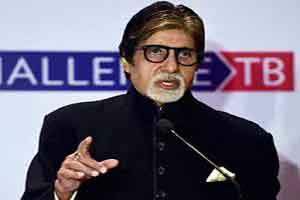 After receiving the award, Bachchan went live on Facebook with Verma to discuss the cooperation between the two nations to spread awareness about the much-feared disease. Remembering his first encounter with Verma, Bachchan said that they have been associated since 2015, when the latter was awarded the Padma Vibhushan. The “Pink” actor also said that it was embarrassing that India is the largest carrier of TB in the world. The actor was especially impressed with the involvement of women in spreading awareness and busting myths about the disease under this initiative. He said that it was inspiring how they fought both with the disease and fear of alienation due to the social stigma about the disease. The US ambassador also said that the US government has been working with the Indian government for over 20 years on tuberculosis. “Over USD 100 million have been invested… we have treated over 15 million people with our Indian partners, saved millions of lives from the disease,” he added.